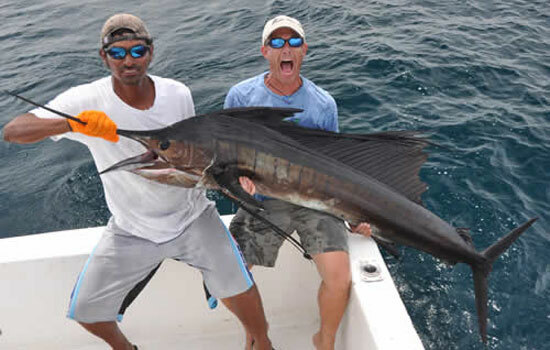 Costa Rica offers travelers the world’s best sport fishing. During your deep water fishing you will come across a number of billfish on Pacific Coast. You will come across bass fishing and snook fishing and many other deep water fish on Caribbean Coast. The various options available in this beautiful country will make sure you have an unforgettable Costa Rica vacation and fishing trip. Before packing your gears, there are few things to be aware when booking your sport fishing trip. There are different geographical sites, currents, micro-climates that affect fishing seasons. The boat you charter and specific captain can make your fishing trip a worse nightmare or unforgettable experience. Nevertheless, some factors contribute significantly to getting a package that will suit your need and fishing trip. There are two seasons in Costa Rica. December-April is mostly regarded as most appealing seasons for a trip. This gives tourist an amble chance to see the land and all outdoor tourism adventure that are around in addition to the fishing adventure. The most interesting thing is that, quite a number of species are fished at those months. Therefore, this is the time ideal to go for fishing trip. This can be interesting and worthwhile when you are combining your fishing adventure with a family holiday. Your family member will definitely have a splendid time doing many other things available to enjoy Costa Rica, including our Spiritual Wellness Retreat in Costa Rica. On the other hand, this season is referred to as high season. Because a higher number of tourist, unfortunate prices and less availability. When less crowding or budget is important as far as you are concerned, then consider making your tip at another time. Pacific coast is where to be when you are seriously after sport fish like Sailfish, Wahoo, Marlin, Dorado, Tuna, and Roosterfish. You can come across great Snapper, Mackerel, and Snook while fishing there. Pacific coast offers one shopping point for best fishing sport as well as eating point. When you get adventurous and happen to be looking for tarpon or snook, then Caribbean coast is the best option for you. You will come across great tarpon and snook fishing, less crowd, typically good prices on tourism and fishing packages. Prices of packages vary depending on the place for booking your fishing charter. There are competitive prices and sometimes you can get discounts. It worthwhile to arrange your fishing trip with the group if friend 4-6 people, to share the cost of boat charter. This will make your fishing adventure not as expensive and you will be able to go fishing more times, to make sure you caught the fish you are after. The adventure on the boat is the unforgettable by itself, where you will be offered to prepare dinner right on the boat from your catch and much more. Some packages, will offer you to sleep on the boat for some nights, some packages are the daily adventure. All will depend on your budget and your goals. If you need help booking your fishing trip, contact us, we will find you the best deal with best boat and crew! For a successful fishing trip, you need to have a captain with good knowledge about water. With that, you will end up having a wonderful fishing trip and memorable moments. Experience captain will know, where to go for the type of fish you want to catch, knows the waters and will make it safe and fun at the same time. Choose wisely, go for experienced crew and good boat to get the best time from your deep water fishing trip vacation. The condition of the boat and equipment to be used really matters. Quite often, many people end up paying a lot for a cheap boat. Some end up at wrong places during the wrong time. With the right equipment, you will end up catching more fish and more possibility to catch what you want. That will make your vacation to be best trip of a lifetime. The rich ocean waters of Costa Rica shores provides abundance of ocean life, with thousands of fish species and many locations available for you to plan your deep water fishing trip.